StairLiftNOW offers a safe and reliable way of overcoming the problem of getting up and down stairs. If you would like more information about Sterling Stair Lifts, including the ultra modern Handicare Simplicity Sterling 950, please fill out the form on the right. We will make choosing the stairlift that is right for your needs both now and in the future much easier. Many of our clients choose to rent stair liftOur rent to own program is very popular. We also sell used stair lifts. The Sterling 950 folds up to only 11″ inches, making it the thinnest stairlift on the market. The continuous charge system gives the 950 a definite advantage over the Acorn Superglide and other DC stairlifts. On most stairlifts, if you don’t park the lift at the correct charging point, you might find the batteries have gone dead, leaving you stuck. With the 950, you do not have to park it on a narrow strip, it will recharge no matter where you are parked. The narrow track, only 5″, is one of the thinnest tracks on the market. It’s low profile means the track does not protrude into your living area. Some lifts, like the Acorn and the Bruno, create tripping hazards unless you purchase an expensive track upgrade. The weight capacity of 309 pounds is class leading. 97% of stair lift users are under this threshold. The 950 mounts directly to the step, not your walls. A full 16′ run of track only requires three mounting brackets. StairLiftNOW makes the Sterling 950 affordable. We are the #1 source of Handicare stair lifts in the Midwest. Our policies of having low no-nonsense prices, fast quotes, reasonable stairlift rental rates, a 365 day a year emergency hotline have established us as a premiere handicap access dealer. We back up our great prices with fantastic service. Please take some time to read a few of the comments from our clients. 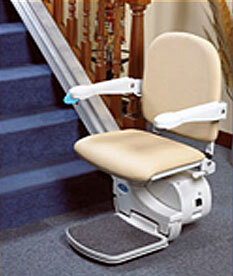 If you have a problem, we are able to replace or repair your stair lift immediately, even under warranty. Most companies have to send the defective part in to the manufacturer to determine if a problem is warranty related. StairLift NOW is able to do “on the spot” repairs. We have all the 950 parts in inventory and can guarantee a speedy repair if it ever stops working. 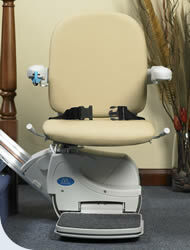 All Sterling Stair lifts are battery operated so they will continue to work in the event of a power failure. The battery receives a continuous charge from the mains supply. 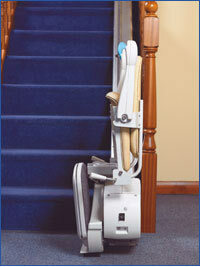 The Simplicity 950 receives this charge irrespective of where the stair lift is positioned on the track. This means the stairlift can be parked on any section of the track when not in use. The Simplicity 950 is also very easy to use. The stair lift is protected by a key switch, once switched on the toggle control is simple held in the direction of travel. The toggle can be placed on the left or right hand arm. The Sterling 950 stairlift has been designed to be both easy on the eye and the purse. It’s loaded with features and benefits usually found on lifts costing significantly more. • DC power with charging anywhere on the track – no more dead batteries! Like its sister model, the Sterling 950 Plus comes equipped with the unique “constant charging strip” track as well as the optional features and seat similar to the “100” model.